Unexpected in so many ways, this beautiful, enchanting red brick Colonial is an entertainers' dream home! 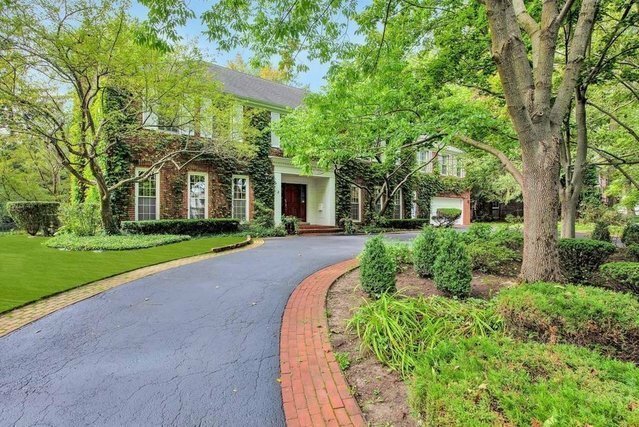 The sunlit and open-floor-plan beauty hides behind stately brick entrance posts and is tucked privately off Sheridan Rd. Wide reception foyer showcases the width and incredible sunlight that fills entire expansive floor. Amazing room sizes throughout with floor to ceiling windows that beautifully transitions the outside to in. Wonderful and lush back yard garden surrounds an entertaining brick paver patio and circular pool! Huge and inviting newer De Giulio kitchen with island and separate breakfast overlook views of nature. Magnificent custom paneled family room with fireplace next to kitchen with two entrances. Formal dining, gracious living and office. Strong second floor with six bedrooms, four full baths (two new white quartz baths). Fabulous newer master suite wing (addition) with vaulted ceilings, walk-in closet, spa bath. Ideal, fully finished lower level with rec room and tons of storage. Two staircases. This home is the best of both worlds as it flows like newer.